Maria Doa, Ph.D., Director of the Chemical Control Division (CCD) at OPPT since 2011, will move to the Office of Research and Development’s (ORD) Office of Science Policy. Prior to leading CCD, Dr. Doa was director of the National Program Chemicals Division (NPCD). Lynn Vendinello, Deputy Division Director of the CCD since 2014, will serve as the CCD Acting Director on an interim basis. Ms. Vendinello has held a number of management and supervisory positions in OPPT and EPA’s Office of Compliance. Tanya Mottley, Acting Deputy Director of OPPT, will resume her leadership role as Director of NPCD. Prior to leading NPCD, Ms. Mottley was the Director of OPPT’s Pollution Prevention Division (PPD). Bryan Symmes will resume his duties as NPCD Deputy Director. Tala Henry, Ph.D., Director of OPPT’s Risk Assessment Division (RAD) since 2013, will be the next Acting Deputy Director for OPPT. Prior to leading RAD, Dr. Henry led NPCD after serving as a toxicologist in RAD and the Office of Water. Cathy Fehrenbacher, now RAD Deputy Director, will serve as RAD Acting Director. Ms. Fehrenbacher has held exposure assessment-related supervisory positions with OPPT; she began her career at EPA as a senior industrial hygienist. These are significant leadership changes and are likely intended to maximize OPPT efficiency. 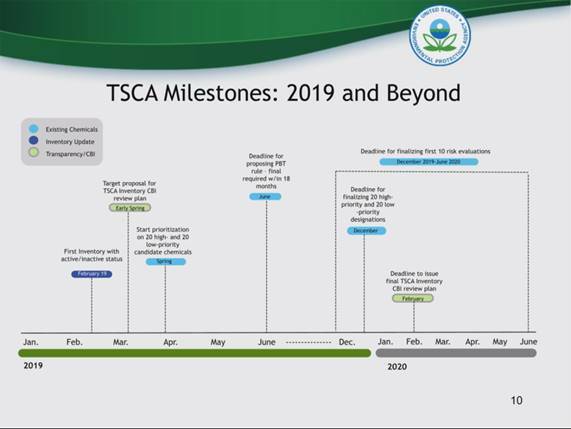 We applaud OPPT’s continuing efforts to implement TSCA and the changes occasioned by the enactment of the Frank R. Lautenberg Chemical Safety for the 21st Century Act almost two years ago.